I can’t recall where this recipe came from but it’s in my scribbled notebook of ‘keeper’ recipes. The ones that aren’t in my core cookbooks I keep there so I can easily remember and find a tried and true option when I need one. 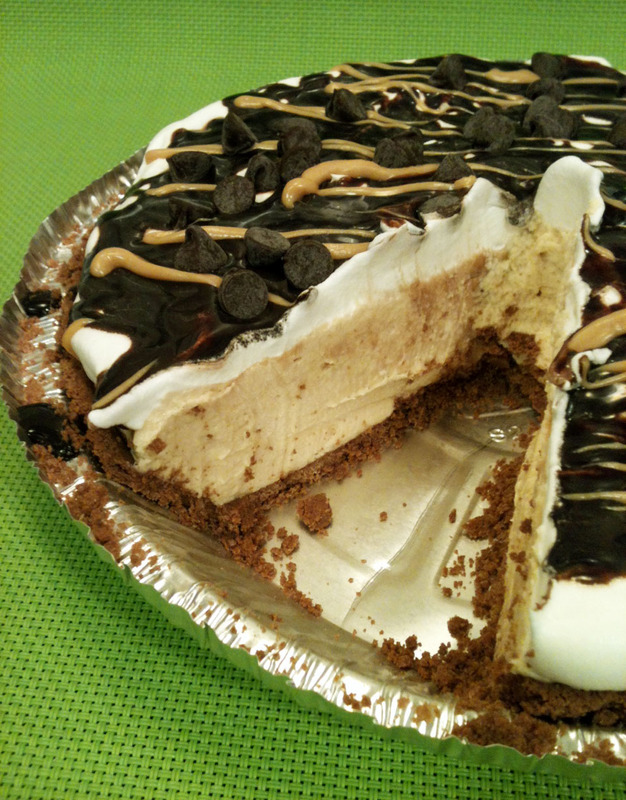 This pie is so rich and sinful even though I always make it with low fat cream cheese and diet whipped topping. People go nuts for it, so much so that last time I whipped one together for a get together with Mr. Bacon’s side of the family, I didn’t even get a single slice! To make up for it, I had an extra big slice of this one. And it was fantastic. Beat together peanut butter, cream cheese and sugar. Fold in 3/4 of the whipped topping and spoon mixture into the pie shell. Spread the remaining whipped topping over the top. Drizzle the chocolate sundae syrup liberally overtop. Place another 2 tbsp of peanut butter into a small sandwich bag and microwave for approximately 30 seconds or until liquid. Snip the tip of the bag and drizzle the peanut butter overtop of the chocolate sauce. Sprinkle the chocolate chips on top. Place in the fridge for at least an hour to firm up. Overnight is best though. ** Tip ** – Invert the lid of the pie crust and reseal the edge to cover your pie while it’s in the fridge. I love my cookie scoops. If you don’t have at least one in your arsenal you should go buy one. Perhaps I should explain why. 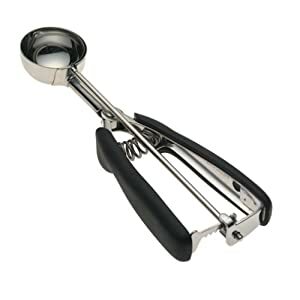 Before the advent of cookie scoops in my world, dishing out a batch of cookies would take a while and would involve a lot of scraping and squishing of dough with two spoons. The cookies would never have a pretty ‘oh those must be from a bakery’ shape and some of them would cook faster than others because they were bigger or smaller. Now my cookies are perfection and I can scoop out two whole trays in a couple minutes flat. – Scoop ice cream – You get perfect scoops every time! – Making meatballs – Again, perfect size and way faster. I will never go back to the two spoon method ever again. Now when you go out to buy yourself one, do not make the mistake of cheaping out. Go whole hog and get the Oxo Good Grips versions. They come in three sizes – small (good for tiny applications like chocolate truffles), medium (good for most cookies, mini cupcakes and small meatballs) and large (good for regular sized cupcakes and muffins and large sized meatballs). I’ve never been disappointed with any Oxo product. They usually have superior design and mechanisms and are dishwasher safe. In Canada they’re available at Bed Bath and Beyond, Home Outfitters, Home Sense and at some local stores like @Home in Kanata Centrum. I’ve tried other scoops from Norpro and Wilton. The Wilton one had terrible action on it – with stiff cookie batters the scraper would stick, negating the whole point of the scoop. I found it was too small as well. The Norpro was OK but the action was much stiffer and was really uncomfortable to use. It also had issues binding with stiff dough and I eventually stripped the gears on it trying to pry it apart in frustration. It’s been crazy hot here this week. So much so, that Mr. Bacon installed our air conditioner today. We don’t put it in every summer, but the last few have required artificial cooling in order to sleep in our bedroom. And when it’s this hot, you certainly don’t want to make anything that’s going to heat the kitchen up which is why tonight we had shawarma salad. Sandwich and garlic potatoes from my favourite shawarma purveyor, Ali at Shawarma House on March Road. Ali is an artist. 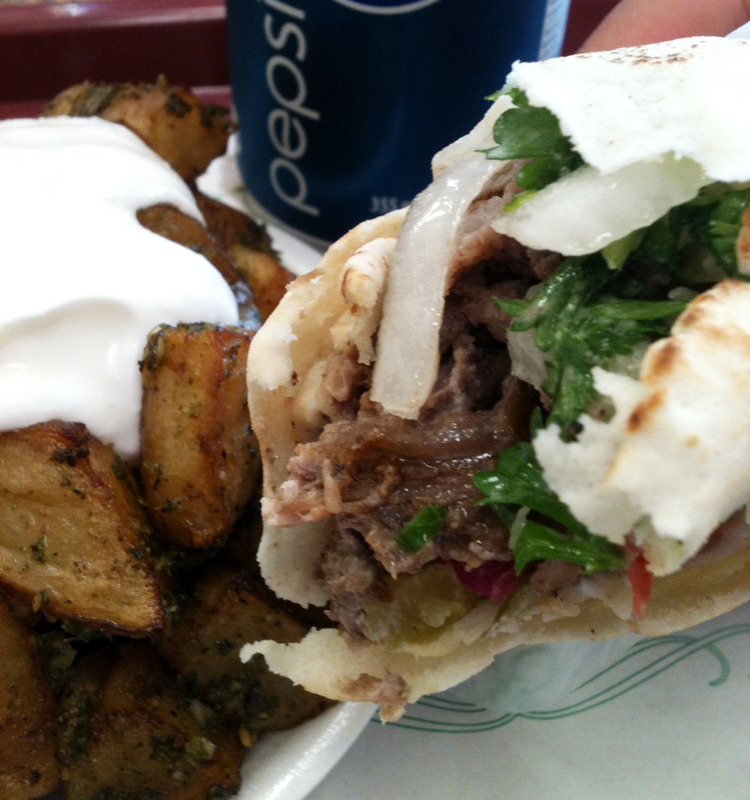 For those of you who are unfamiliar with the shawarma, it’s one of the most popular street foods in the middle east and is incredibly prevalent in Ottawa and Montreal due to the high population of middle eastern immigrants. Shawarma usually consists of meat (either beef or chicken) with vegetables (lettuce, tomato, onion, cabbage) and pickles (turnip and Lebanese cucumber) slathered in sauce (garlic, hummus, tahini) and wrapped in a pita. What I call shawarma salad though is a traditional Lebanese salad called fattoush with grilled chicken marinated in yogurt, lemon and middle eastern spices. 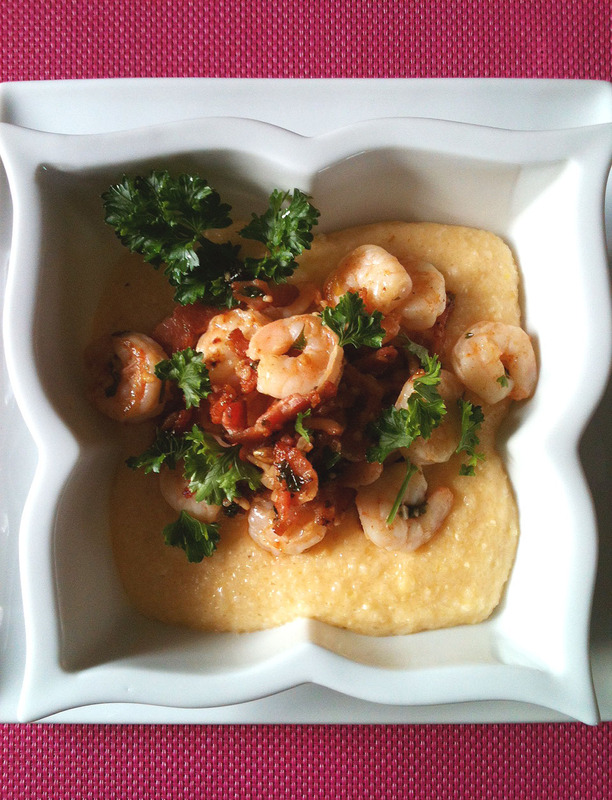 It’s intensely fresh and flavourful and makes a great light summer meal. Marinate the chicken for at least an hour. It’s best if you prep it in the morning. When you’re ready for dinner, start the BBQ and grill the chicken over medium heat. While it’s cooking, dice the vegetables for the salad and mix the ingredients for the dressing in a separate bowl. 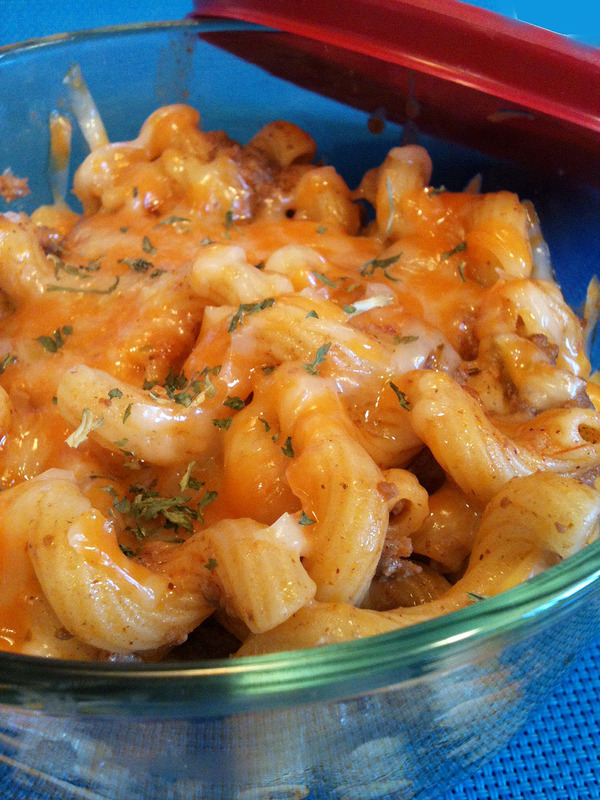 Don’t fudge on the fresh parsley and the fresh lemon – it makes a difference. Take the pita and rip it into bite sized pieces. Place them on a disposable cookie sheet and spray lightly with Pam. Sprinkle with a little sumac and place the cookie sheet on the BBQ with the chicken until they’re crispy. When the chicken is done let it rest for 5 minutes. 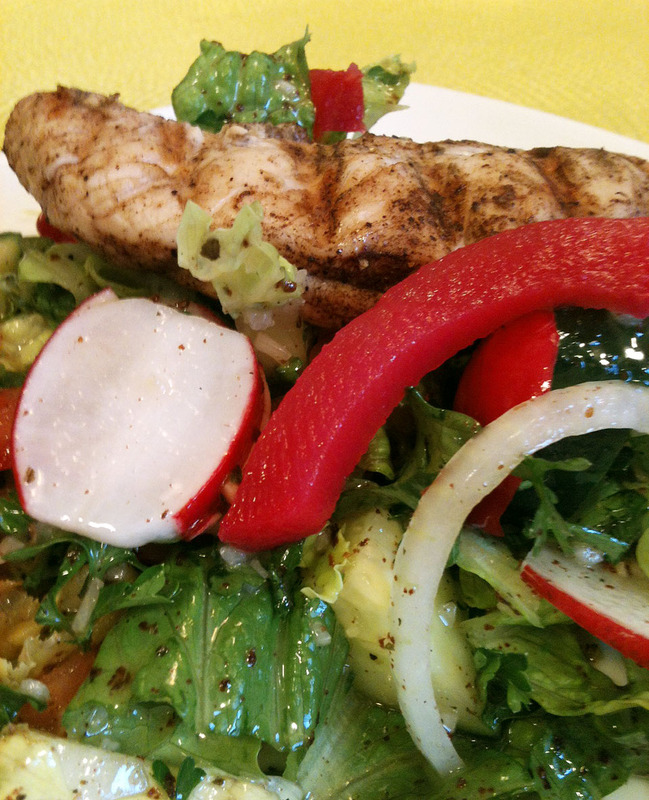 Take this time to pour the dressing on to the salad (leaving the pita ‘croutons’ aside) and toss well. You can choose to dice the chicken and include it in the salad, or place it on top. Garnish with the pita croutons and the pickled turnip pieces. Yes, the turnips are bright pink and look crazy, but they taste awesome really add a great dimension to the dish. You should be able to find the pickled turnip, shawarma spice and sumac at your local middle eastern grocery store. Although I see that Bulk Barn (at least the location nearest me) is now carrying sumac as well. So, what are my two desert island cookbooks? 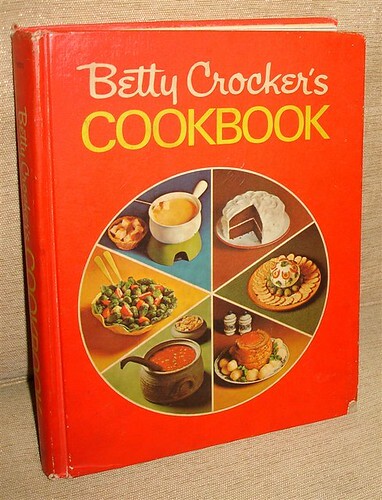 One is Betty Crocker’s Cookbook, specifically the ‘red pie’ edition first printed in 1969 – the hardcover, not the 5 ring binder. What makes Betty so awesome over 40 years later? This book is filled with core recipes like scalloped potatoes, yorkshire pudding, 7 minute frosting and things that are making a comeback like chess pie. It’s got great visual instructions on how do to things like cut a pineapple, make a lattice pie crust and what cuts of meat come from what part of the cow. It actually contains the first recipe I ever made – chef’s salad – for a project in the third grade. Why I chose to make salad for third graders, I have no idea. The kids who made snowball cookies and French toast were a lot more popular. Betty’s book is still being printed and I in fact have a more ‘modern’ version as well. It still has some good stuff, but it’s been heavily pared down and crammed full of modern classics like buffalo chicken wings, totally missing some of the stuff that made the original so awesome. Now to get your hands on one of these, you can either pilfer it from your mom’s collection, or you can jump on eBay and hope not to get outbid (I’ve seen copies go for as much as $100 depending on the condition). The best way to find one is likely at your local used book store though. The prices are generally more fair and you don’t have to pay shipping! 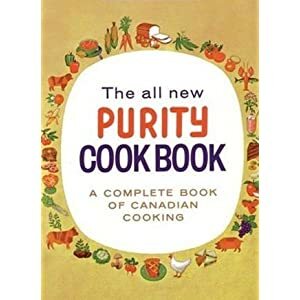 Desert island cookbook #2 is the Purity Cookbook. The edition on the market now was carefully reproduced from the 1967 edition. It’s got great charts for roasting all kinds of meats and recipes for just about everything that your grandmother probably put on her table, unfortunately including ‘gelatin desserts’. Given the fact it was published by a flour company, the breads section is especially great with instructions for lots of classic loaves, waffles, muffins, scones and biscuits. The page that is most marked in this book for me is the apple crisp though. 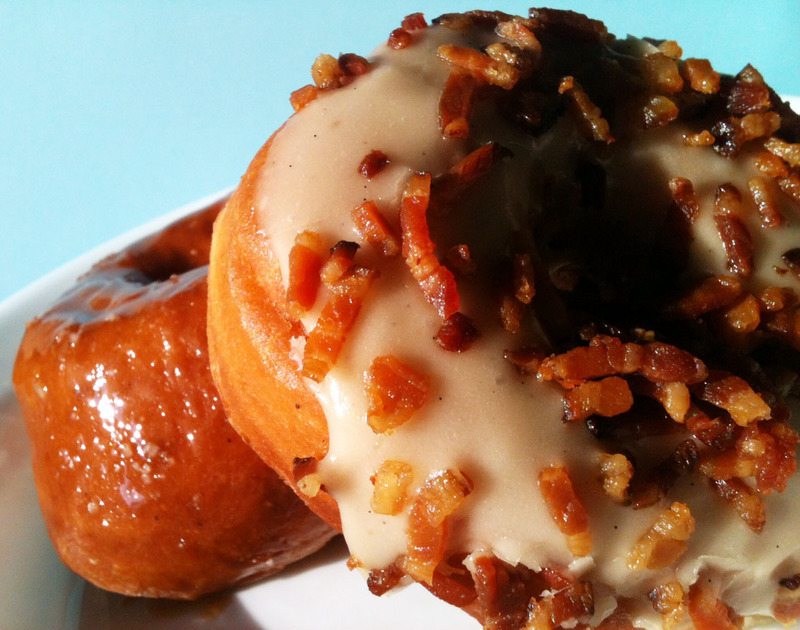 The Purity version is nicely sweet and bakes up very crispy on the edges. MMM. Now I want apple crisp. There’s really no excuse not to pick this book up. At under $20 and readily available on Amazon and Chapters it should be part of your collection if it isn’t already. Makes a great shower gift for upcoming weddings!